It appears that Ezekiel Ansah’s six-year stint with the Detroit Lions is coming to an end after battling a shoulder injury throughout a majority of the 2018 season. 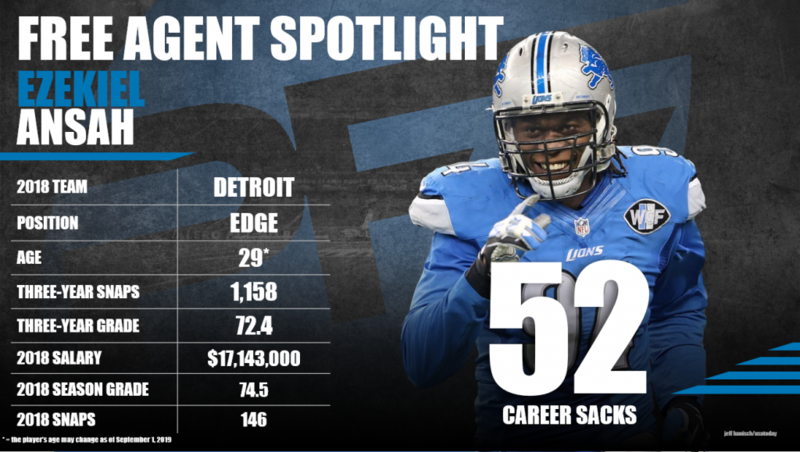 Ansah played 80 games for the Lions (seven in 2018) and amassed 52 sacks and 271 total quarterback pressures. The BYU-alumnus has been linked to various teams but will be turning 30 before the 2019 season begins, bringing his long-term viability into question. Ansah’s ability doesn’t stop with his pass-rushing prowess. He has displayed his run-stopping ability, as he’s earned a 69.0-plus run-defense grade in four of his six seasons. The edge defender’s most prolific season occurred in 2014 when he caused 64 quarterback pressures (T-8th) and earned an 82.5 overall grade (6th). Ansah will have to turn back the clock following an injury-riddled year where he earned a 74.5 defense grade, but there may not be a surplus of suitors with the pass-rusher-heavy class entering the NFL Draft this year. Subscribe to Pro Football Focus’ ELITE subscription to research Ezekiel Ansah’s grades, advanced stats, snaps and more in Premium Stats 2.0.